What’s next, restricting those under 18 to soft foods they can eat with a spoon? How did things ever become this absurd? What would Winston Churchill say about the rampant “Nannyism” in today’s UK? We were skeptical about the knife ban, until we located the House of Commons Legislation Report. As originally passed in 1988, the knife-purchase age limit was 16 years, but, according to the report: “Section 43 [of the Violent Crime Reduction Act 2006] amends section 141A(1) of the Criminal Justice Act 1988 under which it is currently an offence to sell a knife or an article with a blade or point to a person under the age of 16 years. Section 43 increases that age to 18″. “It is difficult to see how the proposed age limit for knives can work. The bill will land us in the ridiculous situation where a 16- and a 17-year-old can get married and set up home on their own, but can’t buy a kitchen knife”. 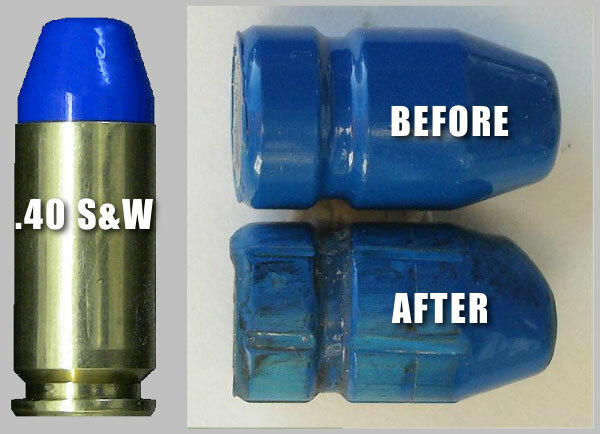 Share the post "Welcome to the Nanny State…"
In the photo below, a .40-caliber bullet is shown before and after firing (the bullet was recovered from the target). You can see that the fired bullet (labeled “after”) has been engraved by the rifling, but very little, if any, lead was exposed. No this is not a hoax — no Photoshop tricks here. ARES offers a a full line of colored pistol and rifle bullets from .25 caliber up to .58 caliber. Ares even offers colored shotgun slugs. We haven’t seen ARES bullets in the USA yet, but they are sold throughout Europe by ARES Distributors. Though ARES colored bullets do look like Jelly Beans, they are most definitely NOT to be eaten. 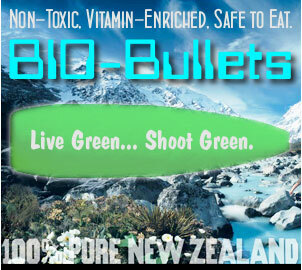 We will still have to wait a while for snack bullets, such as BIO-Bullets, the vitamin-enriched “Incredible Edibles” unveiled in our 2010 April Fool’s Edition. Precision Bullets in Texas sells cast lead bullets coated with a proprietary moly-polymer matrix. With this special coating, the moly does not rub off like most moly-coated pistol bullets. The coating is tough enough to survive heat that will melt the lead core (See Photo). This Editor has shot thousands of Precision Bullets’ coated bullets in my .45 ACP and .40SW pistols. These “Black Bullets” are extremely accurate and the leading in the barrel is dramatically reduced compared to normal cast lead bullets. Share the post "ARES Color-Coated Cast Bullets from Slovakia"